Journalists like to do a couple of things. They like to talk about the the world around them. And they like to talk about themselves and their own peculiar world. 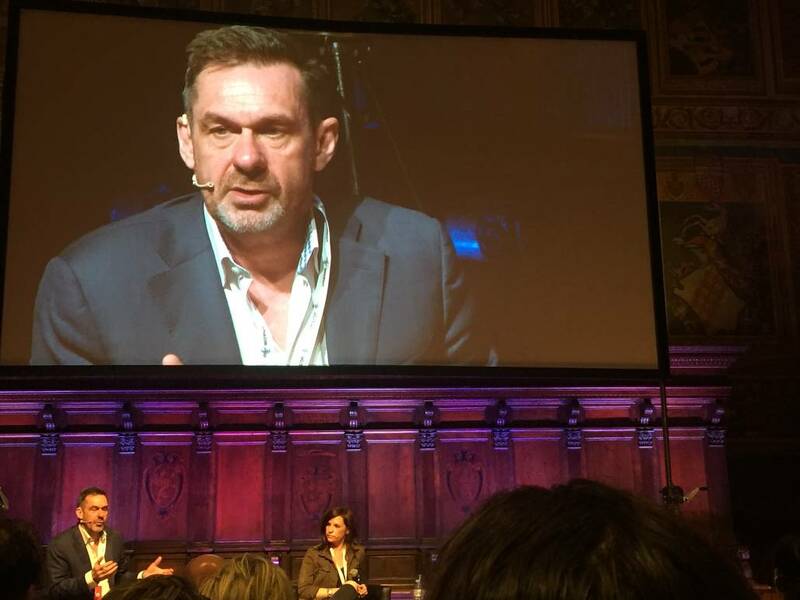 Both tendencies were up front and indulged fully at this year’s International Journalism Festival in Perugia. First, the festival. It’s an amazing few days. Reporters and editors fly in from around the globe tothis central Italian city. Some come from large news organizations like The New York Times and La Repubblica. Some are freelancers, while others may be documentary filmmakers. 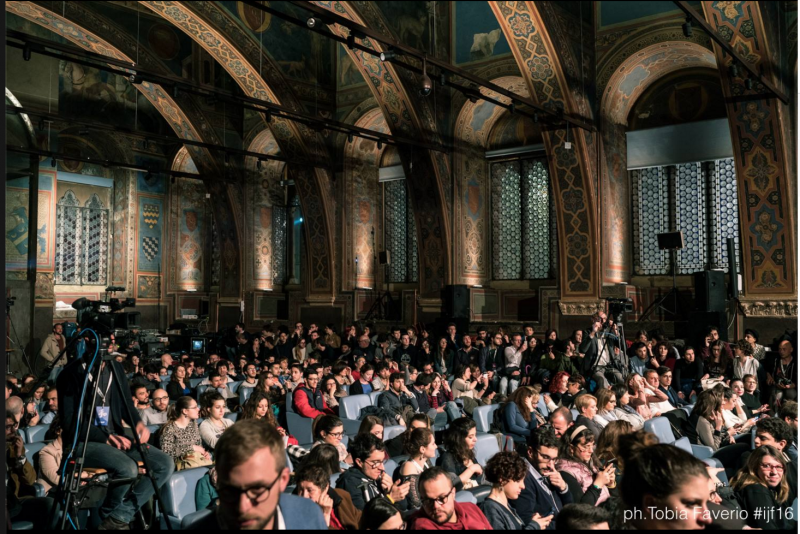 It’s five days of panel discussions, films, workshops, while attendees range from students from Perugia’s university, to working reporters and editors, to the merely curious of all ages. The venues are spread throughout Perugia’s compact centro storico and range from hotel meeting rooms to grand medieval guild halls. And, best of all, it’s free. I’ve been to a few of these, and each time I check the headphone check-out rate. The bigger sessions have simultaneous Italian/English translating via headsets, and this year the headphone check out rate seems to be much lower, especially among the students and younger reporters. Well, the Italians, anyway. What we’re seeing, at least to me, is the spread and adoption of a common bridge language, English, and its greater adoption among younger Italians. The festival reflects that greater cosmopolitanism. A few years ago, the sessions evinced a more internal soul-searching among the Italian contingent, with feature documentaries and panel discussions centered on Italian concerns. But this year’s festival was fully global in outlook, with sessions on the news business and new models, the refugee crisis in Europe, and such issues as the European Union’s economic straightjacket of countries like Greece and cybersecurity and cyberwar. And looming over much of the discussions was the extremely long and strange electoral season in the United States, and, of course, the rise of Donald Trump. An early evening session feature two British journalists, Paul Mason and filmmaker Theopi Skarlatos, and moderator Leonardo Bianchi of Vice News Italy. Bianchi asked Skarlatos and Mason about their experience filming last year’s crisis in Greece after the election of the left wing Syriza, led by Alexis Tsipras. The pair had unparalleled access to Tsipras and his cabinet while they tried to pry the unbending Germans from their fixation on an austerity program that devastated the Greek economy and caused untold human misery. As journalists, the pair were shaken by what they saw as a deliberate attempt to destroy Greece’s government and sovereignty. 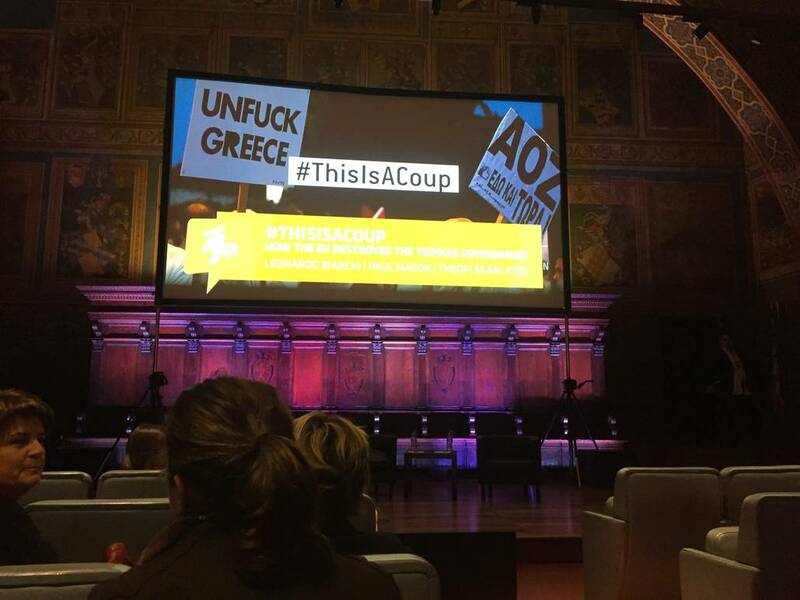 The resulting film’s title gives you a good clue to the duo’s take on the matter (and it happens to be a Twitter hashtag in wide use during the one-sided negotiations between the Greek government and the financial creditor troika): #ThisIsACoup. You really get to see the human dimension as the crisis unfolded. (You can see the film >> in four parts). Often panel discussions took on a life of their own, not adhering to the program. 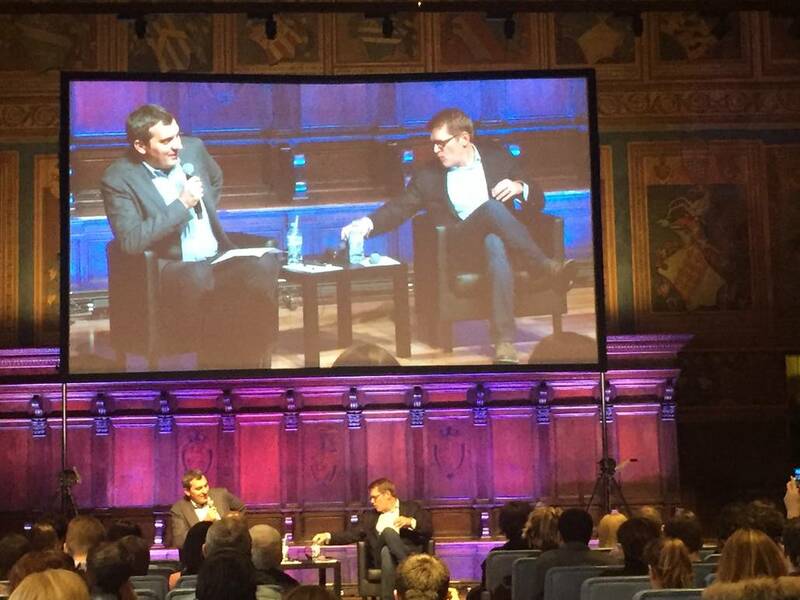 One of them was supposed to the “Explanatory Journalism” featuring la Repubblica editor in chief Mario Calabresi and former Obama White House press spokesman (who is now a media executive at Amazon, one of the festival’s sponsors this year) Jay Carney. The two began talking about how journalists can and should explain what’s going on. Calabresi talked about the need to slow down and analyze rather than report irrelevant factoids. And, looking at the U.S., he wondered out loud when the hyper-polarization that he saw could even produce decent journalism. But then the 800-pound gorilla Donald Trump symbolically entered the room. Calabresi, a passionate and personable speaker, kept pressing Carney to explain the Trump phenomenon, and Carney did his best to explain the mentality that leads to this U.S. style Berlusconi-style anti-politician. (In a few words, he said that Trump’s tapping into the anger of people who think they’ve been abandoned by globalism and a multi-cultural society.) They asked the audience at one point, “who likes Trump?” and the crowd shouted “no!” But I thought I heard more nervousness than conviction in people’s voices. Toward the end of the festival, it turned inward for just a bit, to recognize the locale. The Sunday morning session was attended mostly by older perugini, and featured regional president Catiuscia Marini and Anna Mossuto, the editor of Corriere dell’Umbria, which celebrated its 30th anniversary recently. One of the weird ironies of Umbria and its capital Perugia is while they are centrally located, transportation in and out of the region is, to be kind, spotty. Italy’s high-speed train network bypasses it, while the regional airport is subject to the whims of low-cost airlines. (A recent Alitalia service from Rome to Perugia’s airport has carried, at its maximum, 19 passengers.) Marini spoke with passion about how she and the regional government have tried various ways to get infrastructure support from the central government. Finally, she said, some aid is coming. The attendees who crowded the city’s streets, hotels and restaurants seemed to have no trouble getting here. But the festival, successful as it may be, isn’t something that a region can depend on for its continued viability. We’ll see how Marini’s efforts play out in the next few years.